Kapil Dev was a former Indian cricket team captain and coach. He was right arm pace bowler and an effective batsman. In his captaincy India won the cricket world cup in 1983 for the first time. 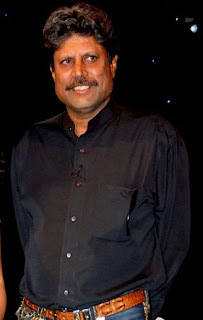 He was born on 6 January, 1959 in Chandigarh. His father was Ramlal Nikhani and his mother was Rajkumari. His father was a building and timber contractor. His parents migrated in India during the partition of India. He is married to Romi Bhatia. They has a daughter Amiya Dev. He made his debut in the domestic cricket in 1975 against Punjab. He played for Haryana in domestic cricket. He made his international test cricket debut on 16 October, 1978 against Pakistan in Faisalabad. India lost that series by 2-0. In that series kapil dev scored the India's fastest test half century of that time in 33 balls. He made his ODI debut on 1 October,1978 against Pakistan. He took 1 wicket and scored 13 runs in that match. He made his debut as Indian cricket team captain against Sri Lanka in 1982-83 season. His biggest achievement as a captain occurred when India won the world cup in 1983. He scored 175 runs of 138 balls against Zimbabwe in a match of world cup when the teams score was 17/5. Wisden magazine regarded this innings as a one of the top 10 odi batting performances of all time. He holds some of records in cricket history. He is the only all rounder who has got 400 test wickets and 4000 test runs. He also has a record as a youngest test cricketer who has took 300 wickets. He was made coach of Indian cricket team in 1999 for a small time. He has won many awards such as Arjuna award, Padma shri(1982), Padma Bhushan(1991), Wisden Indian cricketer of the century (2002). He was included in the Icc cricket hall of fame in 2010.